My camera reads blues oddly, hence the 2 colors in the photo. It really helps to define the true colors. My camera reads blues oddly, hence the 5 colors in the photo. It really helps to define the true colors. 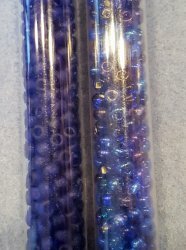 Dark Berry Frost, Matsuno, 6" tube, about 25 grams, Color is on the left. My camera is lousy with some colors hence the 2 colors in one shot; it helps define the colors. This one is the one the left. 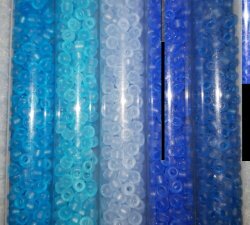 My camera is lousy with blues hence the 5 colors in one shot; it helps define the colors. This one is the second from left.